In a continuing series about (mostly useful) everyday objects, back to the kitchen, where today I needed some fresh garlic for an Indian dish of brown rice, dal, and vegetable bits with curry spices (a Penzey’s “balti mix”), so I resorted to the household’s (aluminum) garlic press. 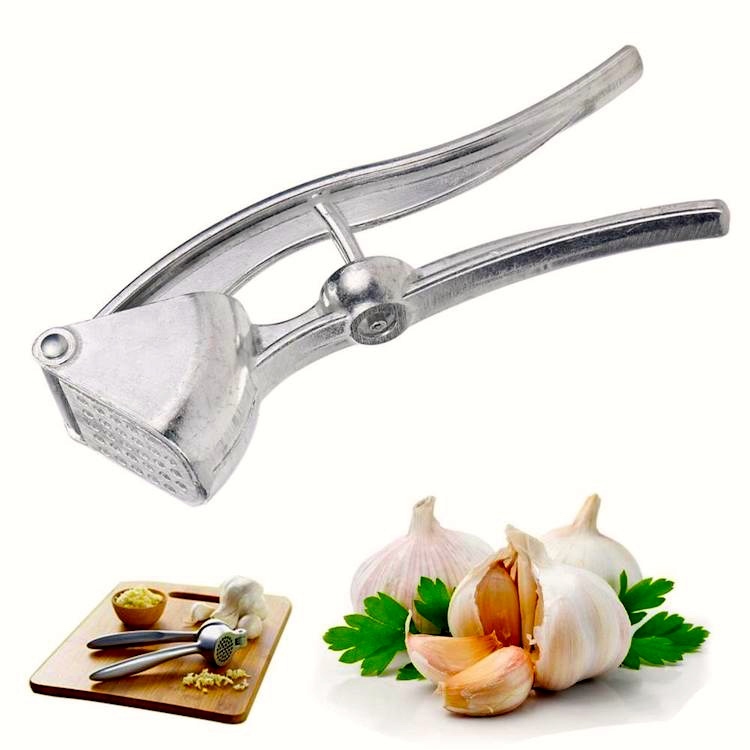 A garlic press (also known as a garlic crusher in Australia, New Zealand and the United Kingdom), is a kitchen utensil [usually made of aluminum or stainless steel] to crush garlic cloves efficiently by forcing them through a grid of small holes, usually with some type of piston. Many garlic presses also have a device with a matching grid of blunt pins to clean out the holes. Garlic presses present a convenient alternative to mincing garlic with a knife, especially because a clove of garlic can be passed through a sturdy press without even removing its peel. The peel remains in the press while the garlic is extruded out. Some sources also claim that pressing with the peel on makes cleaning the press easier. Garlic crushed by a press is generally believed to have a different flavor from minced garlic, more of garlic’s strong flavor compounds are liberated. A few sources prefer the flavor of pressed garlic. … On the other hand, some chefs say garlic crushed in a press has an inferior flavor compared to other forms of garlic. This entry was posted on December 2, 2018 at 5:07 pm and is filed under Gender and sexuality, Language and food, Linguistics in the comics. You can follow any responses to this entry through the RSS 2.0 feed. You can leave a response, or trackback from your own site.